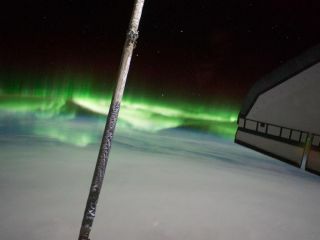 Stunning NASA videos are giving an astronaut's-eye view of spectacular aurora displays in the Southern Hemisphere. One video stitches together photos taken by astronauts aboard the International Space Station on Sept. 17, as the orbiting lab cruised over the Indian Ocean near Australia and Madagascar. It shows the aururoa australis, also known as the southern lights — the counterpart to the northern lights. A separate striking video of the southern lights was taken by space station crewmembers on Sept. 11, 2011, as the orbiting laboratory passed over Eastern Australia. The dazzling southern lights, like their northern counterparts, are triggered by charged particles from the solar wind interacting with Earth's atmosphere. The dynamic particles travel to Earth's polar regions along the planet's magnetic field lines, then emit brief flashes of light as they encounter the atmosphere. It's not uncommon for astronauts on the space station to witness and photograph these stunning light displays. In July, astronauts on the space station and space shuttle Atlantis took a series of incredible aurora photos from the orbiting complex. Continuing with the theme of stunning space videos, the creators of the Tumblr blog Infinity-Imagined created a time-lapse movie of the space station as it flies over Earth at night. From the front of the station, the video begins over the Pacific Ocean, with eye-catching golden lights speckled like fireflies on the surface of the planet. The station continues over North and South America before entering a period of daylight near Antarctica. Geography hawks will be able to pick out visible countries, cities and even landmarks, including Vancouver, B.C., San Francisco, Phoenix, Mexico City, and the Yucatan Peninsula. The time-lapse images also offer a glimpse of lightning over the Pacific Ocean, as the station glides over Ecuador, Peru, Chile and the Amazon.